For Week 12 of the 2018 Oregon high school football season, here's a look back at the Plays of the Day. To see complete game stories from all these contests, go to the Prep Football Tab. CLACKAMAS 59, LIBERTY 21: Liberty was forced to punt on its first possession of the second half, and despite a third-and-long, Clackamas answered the bell when Richard Kennewell caught a quick out, spun out of a Marquis Brown tackle, and raced up the sideline 66 yards to give the Cavs a 35-14 lead in their Class 6A state quarterfinal on Friday. JESUIT 23, TIGARD 22: Down 22-17 with just over five minutes to go in the fourth quarter, Jesuit senior quarterback Will Spitznagel piloted a 13-play, 59-yard drive down to the Tiger 1-yard line. And on a fourth-and-goal from inside the Tiger 1, Spitznagel followed center Seth Monahan up the middle to paydirt to give Jesuit a 23-22 lead with 19 seconds left in its 23-22 win in the Class 6A state quarterfinals at Jesuit High School on Friday night. SHELDON 38, WEST LINN 26: West Linn wide receiver Casey Tawa had just taken an end around to the right side and thrown to senior wide receiver Jake Mastrandrea for a 4-yard score that brought the Lions within 31-13 of Sheldon with 1:33 to go in the half. Unfortunately, even that was too much time to leave the Irish. Sheldon drove 59 yards in just 1:17 to score again, getting a 34-yard Michael Johnson Jr. throw to Zach Folsom, and then, a 3-yard Johnson scramble for another score and an imposing 38-13 halftime lead. 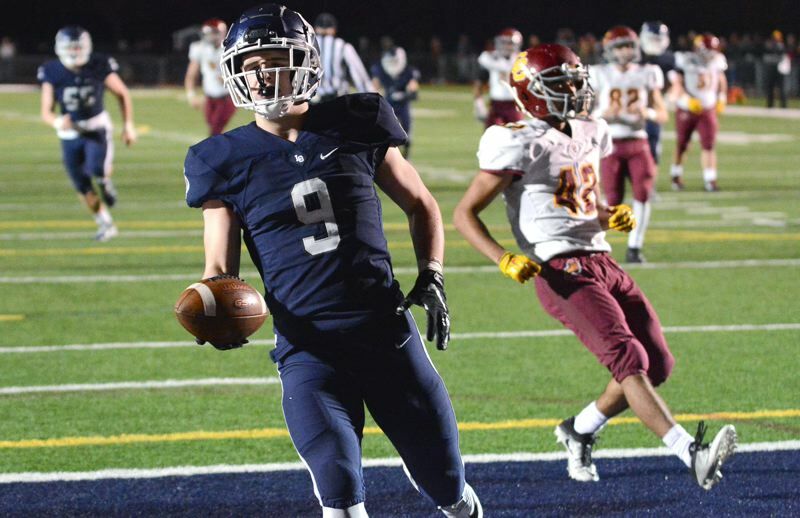 LAKE OSWEGO 35, CENTRAL CATHOLIC 24: The Lakers put away a pesky Central Catholic squad when senior quarterback Jackson Laurent found junior running back Casey Filkins over the middle for a 19-yard touchdown pass on fourth-and-6 to account for the final score with 6:32 remaining. Filkins found the end zone four times. ST. PAUL 46, WALLOWA 16: After Wallowa tied St. Paul at 8-8 early in the second quarter, the Buckaroos took over the rest of the way. After Justin Herberger scored on a 12-yard run to help St. Paul retake the lead, the Buckaroos added a dagger when quarterback T.J. Crawford fired a 55-yard touchdown pass to Jaidyn Jackson to make it a 24-8 game going into the half. SEASIDE 23, GLADSTONE 19: When Gladstone failed to convert a fourth-and-2 play from its own 28-yard line, the Gladiators gave the ball back to Seaside with 11:42 to play. Two plays later, Gulls quarterback Payton Westerholm rolled to his right looking to pass, then scrambled back to his left and scored on a 33-yard run that pushed the Seaside lead to 23-13 and helped put the game out of reach with 10:45 to play.